The following post’s instructions also work with the iPhone 3G! 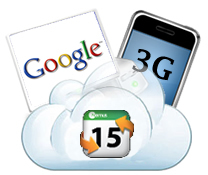 Click here to view how you can sync your iPhone 2G or iPhone 3G with Google’s Calendar Online App. In the instructions on the following website, you’ll find how to modify any iTunes Library so it can also be synced with your iPhone. You can then either manually manage your iPhone on a second computer, or sync different data on different machines (E.g. Music at home, Contacts/Calendar at work). Finally, a solution on how to sync your iPhone Calendar with your Google Calendar exists. Click here for the solution that works fine to start synching! Apparently, as some have noted in the comments, the goosync isn’t working as Apple doesn’t let third party applications change and manage it’s calendar on the iPhone. I will be contacting GooSync support to see if there is a work around. Sorry to all those that tried the steps and not having it working. If anyone managed to make this work, please let me know in the comments. Thanks. 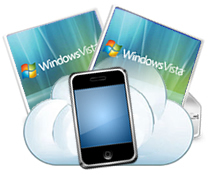 So we’ve covered how you can sync your iPhone with Windows Live Contacts on Windows Vista. Now’s the time for Google… for those people who for a reason or another prefer Google products’ over Microsoft’s. This post will not only show you the how to sync iPhone Contacts with Google Contacts, but also how to sync iPhone Calendar with Google Calendar. This is now possible to an online service called GooSync. Toffa International, the developers of GooSync, has recently added iPhone support to its online service. This means that when you change, create or delete a contact, or an appointment, GooSync takes care to always sync the iPhone with Google’s online services which is done automatically. As for Requirements, you need to either have an iPhone 3G or iPhone with 2.0 Software or greater. 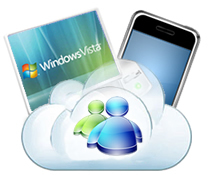 Here’s a nice post about how to talk and chat with windows live messenger, google talk messenger, yahoo messenger, etc on your iPhone without installing apollo or anything else. Now you don’t need your laptop anymore to keep in contact with your friends. During this last week, Microsoft released a new version of its Microsoft Outlook Connector. This happened to add support for the recent update done on Windows Live Calendar which is still in Beta. 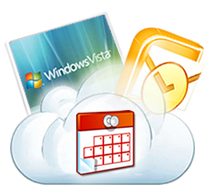 For those that never used the Windows Live Calendar Beta, you can access it on this web address: http://calendar.live.com. 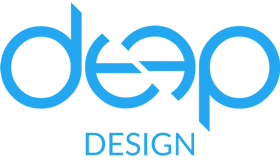 It has a fast and functional Ajax user interface providing a rich experience on the web… supporting many new features making Outlook look even better!! For example, if you have multiple calendars (maybe one to use for work, another one for your events) or even shared calendars, each of them will sync with Microsoft Office Outlook always by using the Office Outlook Connector Beta.